The first rest day saw Ukrainian GM, Pavel Eljanov, going into the sole lead with +2 or 3.5 pts / 5 games. Pavel celebrated his 27th birthday just at the start of the tournament and the result is quite merited as he has been steadily improving from one GP tournament to another. This is also reflected in his other tournaments and he enjoys a current no.9 world ranking. Only one point separated thirteen players after round 5, obviously reflecting the cautious play adopted so far. With so many heavyweight Grandmasters around, we had some very important games again on the stage in Astrakhan today. We had some great fighting games and after 3.5 hours only one game (Svidler - Leko) had finished and the six other tables were showing some very interesting chess. Eventually Mamedyarov - Gashimov also petered out after some heavy pieces were exchanged just before the time control. In general, the no-draw offer rules have turned out well and we are getting great chess in the large majority of the games. Today, Eljanov employed one of the trendy ideas against GM Alekseev of Russia who chose the solid Queen’s Indian Defence. With 7.Re1, white gets black to lose a tempo with 7…Qc8 and only then develops the knight to c3. Alekseev seemed to be well prepared however and around move 20 was enjoying a 30 minute advantage on the clock. The unpredictable Ivanchuk (with white) faced Radjabov in this round. Both players have still got chances of qualifying for the Candidates although their approach in the tournament so far has been diametrically opposite. Once again, Ivanchuk avoided going into a major theoretical duel in the King’s Indian and selected instead a minor but sharp variation of the English opening. 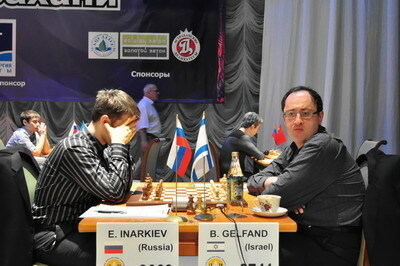 GM Gelfand may be hoping to repeat his great performance in Khanty Mansiysk also in Astrakhan. Boris has already qualified for next year’s Candidates after his World Cup win but he still wishes to add a GP trophy to his cabinet back home. Breathing down the leader’s neck, he had white against another player on +1, GM Inarkiev from Russia and Elista. Although the lowest rated in the tournament, Ernesto has been quite capable of scalping several 2700+ GMs during the GP series. Boris elected to play his favourite line against the Meran with a positional buildup with 6.Qc2. The two GMs trotted out 19 moves of theory before black essayed 19...a6 in lieu of the previous 19…bxa4 played in a cyber game. Two Berlin experts clashed today but not in a Spanish Opening! GM Jakovenko was white against former FIDE World Champion and wild card for this tournament, GM Ruslan Ponomariov. In a Grunfeld Indian he selected a system with 7.Nf3 and 8.Be3 with white innovating on move 13 with Bf4. Jakovenko built up an advantage and Ponomariov, in a difficult position, eventually blundered on move 21…Qc6? missing 22.Bxb5! immediately winning an important pawn. The all Azerbaijani derby between Mamedyarov and Gashimov was very interesting not only from the perspective of two team mates who have possibly worked and analysed so many lines together but also as both players are today constantly jockeying with Radjabov for the number one place in their country. Gashimov abandoned his Benoni and in a Catalan style line, black took the pawn on c4 and gave white ample space to prove his compensation. Last but not least, was a match between two solid and technical players. Akopian and Wang Yue went for one of the main lines of the Petroff. Both players have considerable experience in the Petroff and 17.Qc1 was played before by Akopian against Kasimdzhanov in another GP tournament! There black went 17…Bf6 but Wang Yue tried 17…Qd7 instead. Wang Yue was looking to bounce back, after his round 5 defeat and the missed win in an earlier round against Dmitry Yakovenko. Only a win today could put him back with realistic chances of qualifying for the coveted Candidates place.